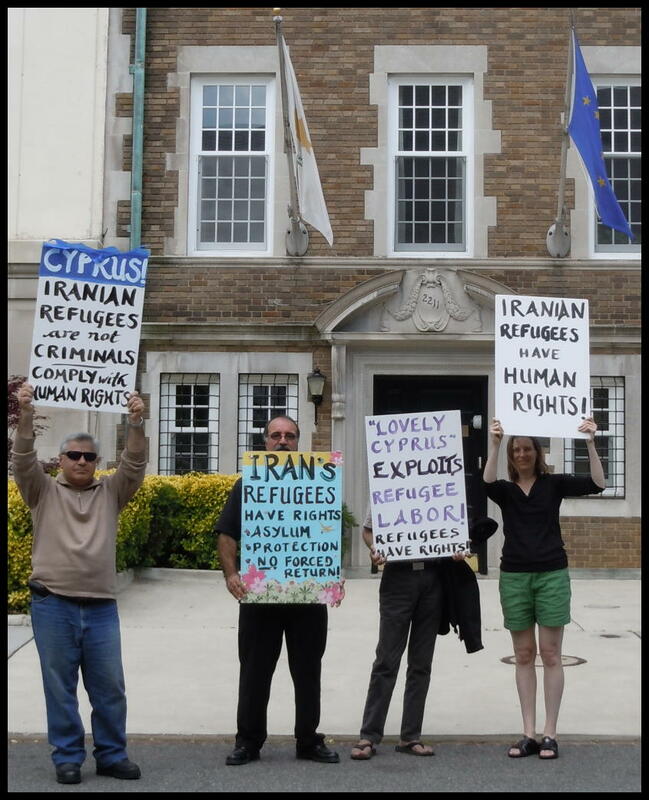 Iranian refugees in Cyprus, like refugees around the world, have long endured the lack of rights and the exploitation that comes with being deprived of a recognized legal status within society. Yet while the dire circumstance of Iranian refugees in places like Turkey and Greece are better known, a veil of silence is draped across the abuses of human rights inflicted on refugees in Cyprus. Iranian refugees themselves have been working hard to break that silence. Groups of Iranian asylum-seekers illegally detained in Larnaca and Limassol Prisons in Cyprus have been on hunger strike over the past few weeks, and they issued a set of demands to be heeded by the Cypriot government and UNHCR. Today’s protest at the Embassy of Cyprus was in support of their demands for the immediate release from detention of all asylum seekers who have been detained on no other grounds than not having a visa or a valid passport; and for the review of the refugees’ asylum applications, corrections made to their files with the help of a reliable interpreter other than Mr. Khalaj, and new rulings on their cases based on their corrected documents. We further demanded that UNHCR confer prima facie status on Iranian refugees, given the Islamic Republic’s stated intention to prosecute political asylum-seekers under Article 7 of the Islamic Penal Code. A previous demand in support of a mother who had been illegally imprisoned for approximately 6 weeks and separated from her child who was given into the custody of another family was no longer in effect: the night before the demonstration it was learned that the mother in question had been released from the hospital (where she had been admitted as a result of her life-threatening hunger strike) and allowed to go home to be with her child. Her husband, however, remains in detention. The demonstrators stood with protest signs in front of the Embassy; many passing cars slowed on the quiet street to better read the signs, and several showed their support by tapping on their car horns. We handed out flyers about the situation facing Iranian refugees in Cyprus (embedded below) to interested passers-by. Persian News Network/Voice of America covered the action. At the end of the action, we signed a letter of protest and slipped it into the Embassy’s mail slot. We encourage all concerned members of the public to contact the Ombudsmand of Cyprus; the Police Authority in Cyprus; the Office of the Inspector General at UNHCR; Maja Kocijancic, Deputy for Catherine Ashton, Representative of the EU for Foreign Affairs; and the Greek offices of the Red Cross to demand an investigation into the violations of the rights of Iranian refugees in Cyprus. I am writing to you with deep concern about the conditions facing Iranian refugees in Cyprus. Refugees report that their asylum cases have been rejected due to the bad practices of a corrupt translator. As a result, many of them have been left in a situation where their passport and/or visa have expired, yet they fear for their security if they are returned to Iran and the known persecution awaiting them there, as explicitly promised by the Islamic Republic. Many are detained illegally in Cypriot prisons for no reason other than their refugee status. Many of those detained still have their asylum applications open, making their detention a clear violation of their human rights. I demand that you urgently investigate the complaint about the corrupt translator, and the practice of illegally detaining Iranian refugees in Cyprus. Refugees have a right under international law to asylum and protection, and they have the right not to be returned against their will to a place where they fear for their safety and security. These fundamental rights of refugees must be respected and upheld. Hello to everybody and thanks a lot .